This week’s minorities in cartoons entry is “Mucha Lucha!,” an animated series that aired on Kids WB from 2002 to 2005. “Mucha Lucha!” focuses on a Mexican town (and world at large) obsessed with lucha libre (Mexican professional wrestling). As such, nearly the entire cast wears wrestling masks. The series’ stars are three children who wish to become the world’s greatest wrestlers: Rikochet, the leader of the trio; the Flea, a kid who refers to himself in the third person and hates bathing; and Buena Girl, a girl who’s a stickler for the rules/code of honor in wrestling. All three attend a school that heavily centers around teaching wrestling, including honing the “special moves” that they all possess. For example, Rikochet’s “special move” is turning himself into a human pinball. The series ran for three seasons of 52 episodes (renamed “Mucha Lucha! : Gigante” in the final season). It was followed up by a made-for-video movie, “The Return of El Maléfico.” After “Mucha Lucha!” left Kids’ WB, it aired for a time on Cartoon Network. As of this writing, there’s only been a handful of episodes released to DVD. The series is notable for being the first major American animated TV series to be produced using Adobe Flash. Until then, Flash was mainly restricted to Web sites. 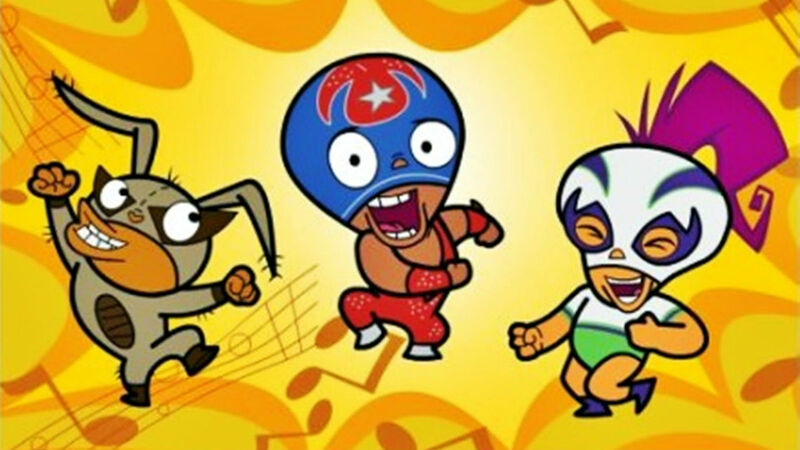 “Mucha Lucha!” and several other TV shows (plus then-current Internet animation) led to Flash (and similar competing tool ToonBoom) becoming a mainstay of TV animation production. Rikochet had two voice actors: Carlos Alazraqui in the first two seasons, and Jason Marsden in the third. Candi Milo voiced the Flea. Kimberly Brooks voiced Buena Girl. Oh man. I remember that cartoon. I also remember it being… too Flashy for my taste. For some reason, I could watch a Flash cartoon online, but on TV… maybe because on TV it’s 20 minutes long. Three, five minutes is about how long I can sustain a sprite-based animation.